Shoreline geomorphology is the result of natural forces including tidal action and storm activity, as well as anthropogenic changes to coastal infrastructure that can alter shoreline evolution and stability. High temporal- and spatial-resolution imagery can increase our understanding of the mechanisms that lead to these changes, and determine the influence of human activity against natural variation. Cynthia Romariz Duarte and team analyzed a time series of RapidEye imagery from 2011 through 2014 to explore changes in shoreline evolution resulting from the expansion of the Port of Pecém, in the State of Ceará, Brazil. The Port has a close proximity to the capital of Ceará, and can naturally accommodate ships with a draft up to 17m. Using digital analyses of the RapidEye imagery, Duarte et al. found considerable accretion of sediment along the shoreline immediately west of the port, with increasing erosion in the outlying areas. Overall, a net accumulation of more than 100,000 square meters of beach area was observed. 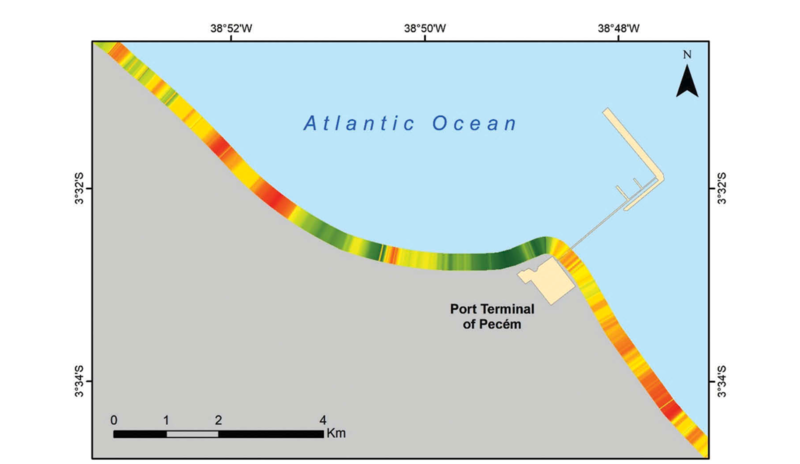 With the Port of Pecém likely to expand, remote sensing analysis will provide a valuable resource to protect not only the welfare of shoreline habitat in the region, but the integrity of the port itself, which depends upon maintenance of its naturally deep berth. The work appears in the International Journal of Remote Sensing. Access to RapidEye data was supported by the Brazilian Ministry of the Environment. Cynthia Romariz Duarte and team analyzed a time series of RapidEye imagery from 2011 through 2014, highlighting regions of shoreline that had accreted sediment (green) versus those where sediment had eroded (red).